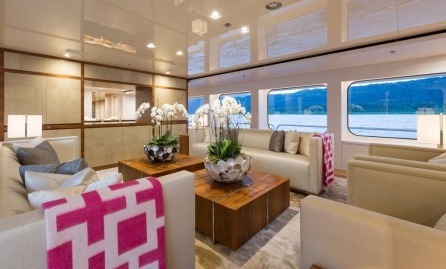 Exquisite contemporary interior; neutral tones with splashes of vibrant accessories. 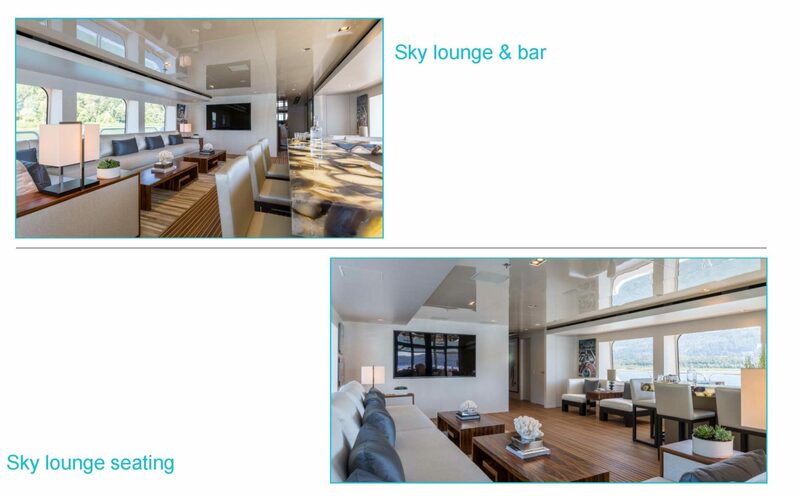 Great selection of chic, yet comfortable, interior and exterior seating and lounging options. 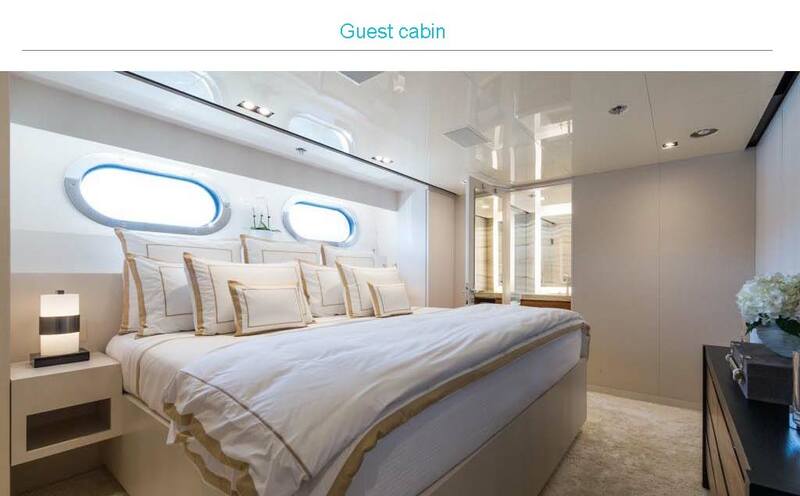 First class captain and crew! 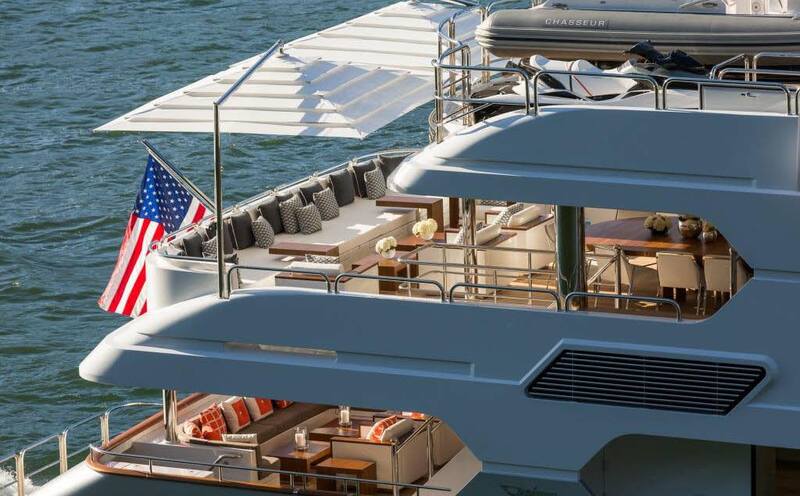 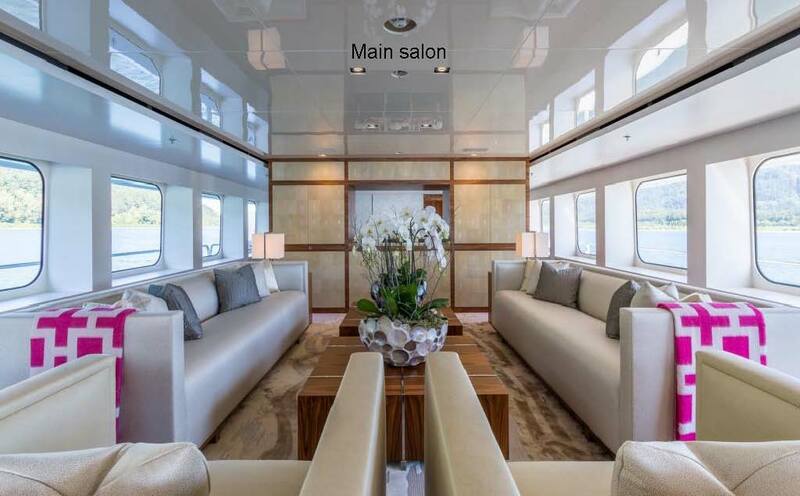 Brand new, the 160’ Christensen motor yacht CHASSEUR, built in the USA in 2016 is modern and makes effective use of Terry Richardson black and white photography art (of David Bowie and Elizabeth Taylor), Mother of Pearl wall coverings, and embossed hair on Hyde paneling. 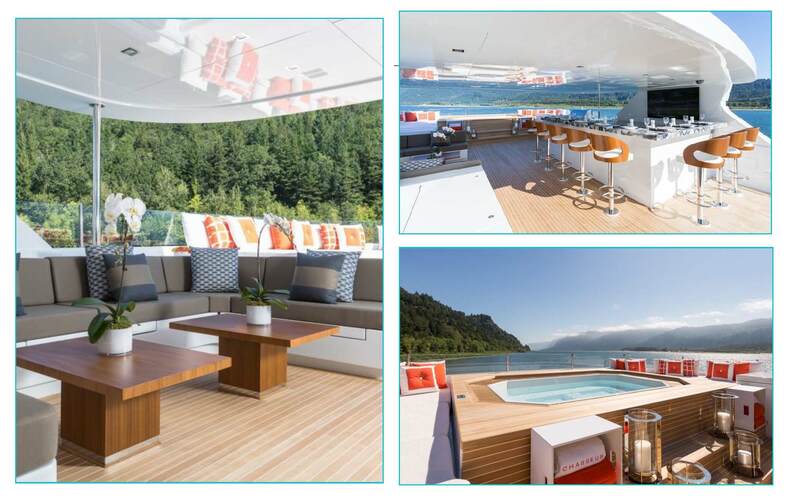 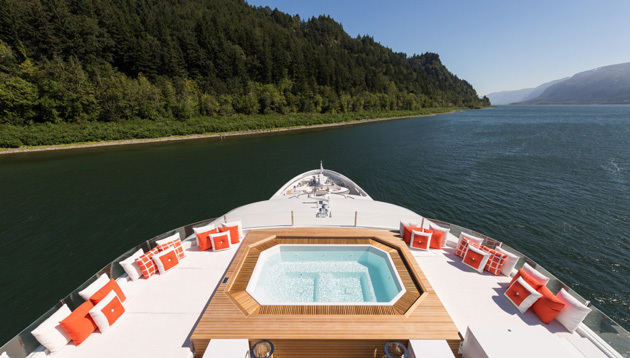 Spacious and exciting, this yacht has floor to ceiling oval windows in her exquisite on-deck, master stateroom, where fur throw blankets add texture to the modern couch under the windows. 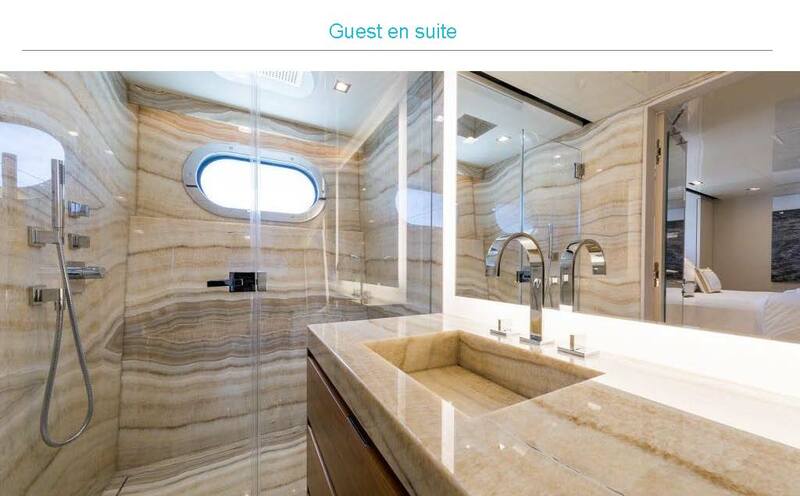 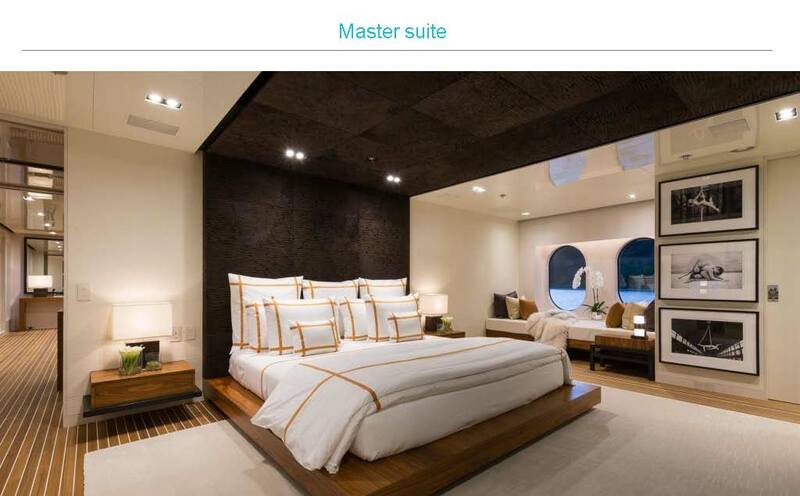 An office adjoins the full-beam stateroom with King-size bed, and heated onyx flooring warms up the spacious stone bathroom with his and her sinks, and double glass shower with rain, steam, and hand-held shower heads. 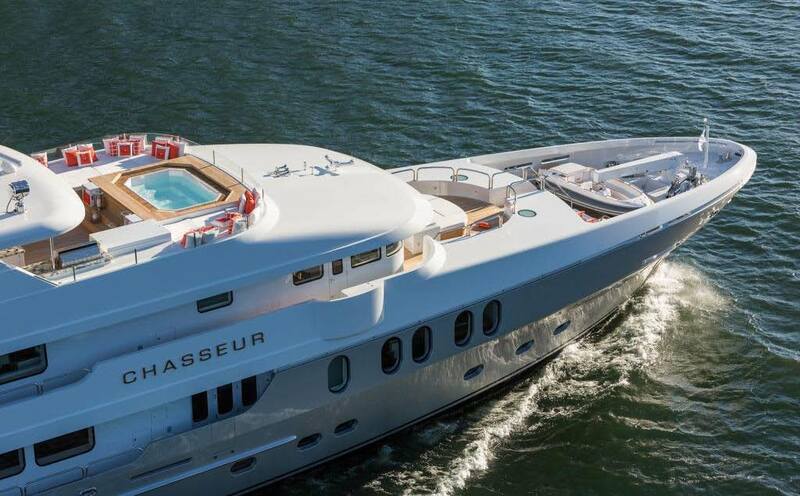 All is brand new and shining! 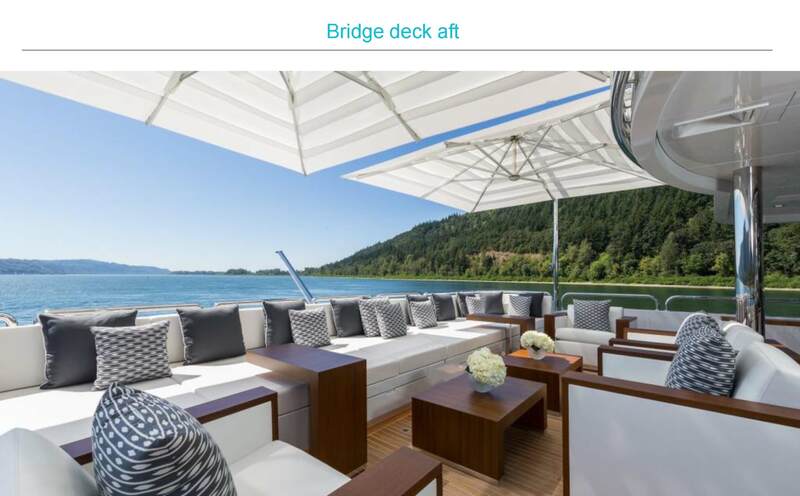 The lack of outside decks around the bridge deck doubles the space of the sky lounge, which seats lots of people for entertaining, lets in lots of natural lighting through windows, has an onyx bar with two TVs, and opens up to a vast, outdoor, air conditioned terrace, offering dining and seating under umbrellas and a hard top for shade. 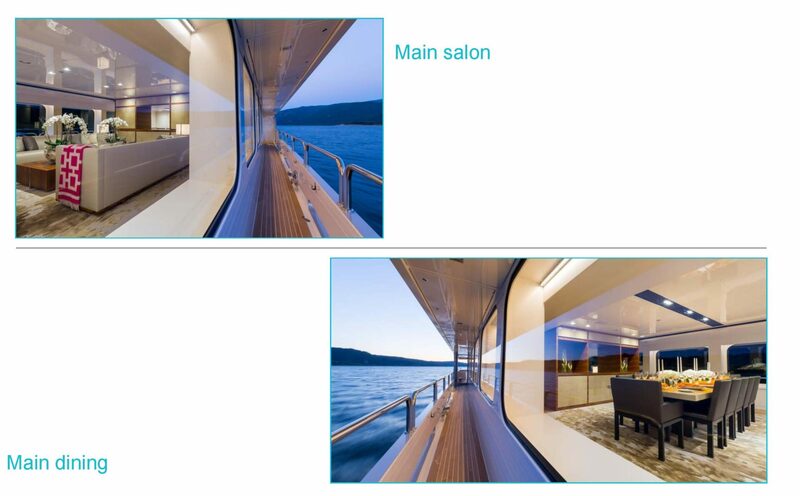 The glass doors open up wide, so the two areas become one. 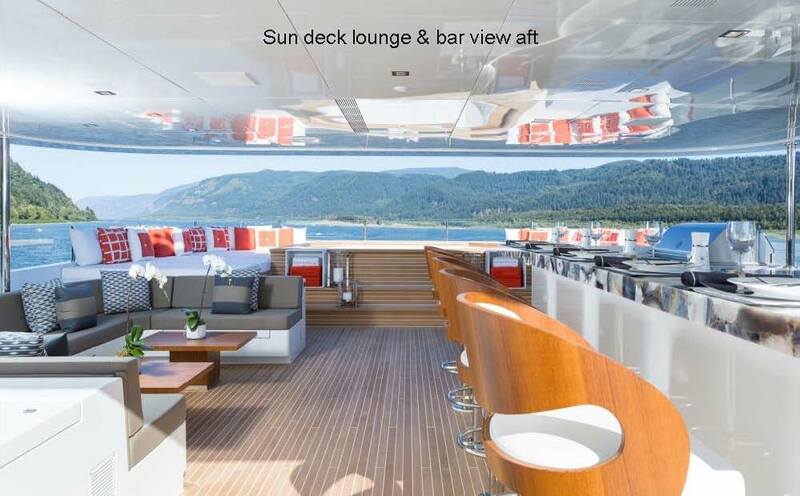 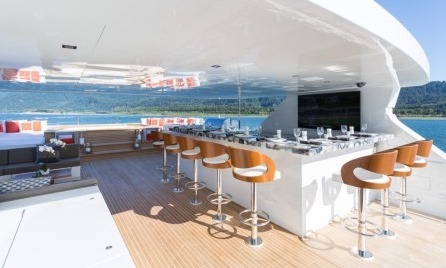 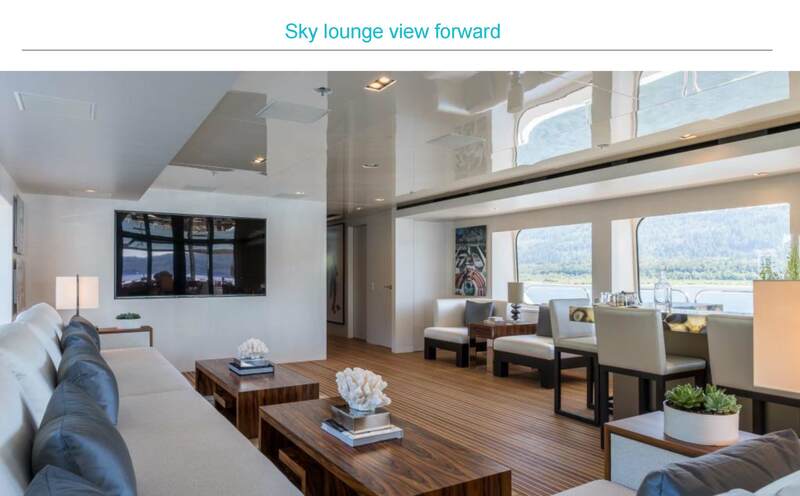 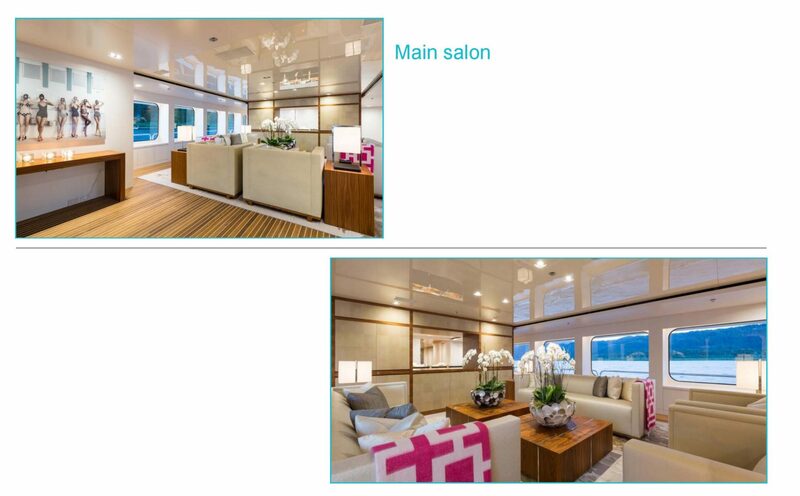 Opening to a second aft deck below, the main saloon is modern and has lots of seating and pink photography art. 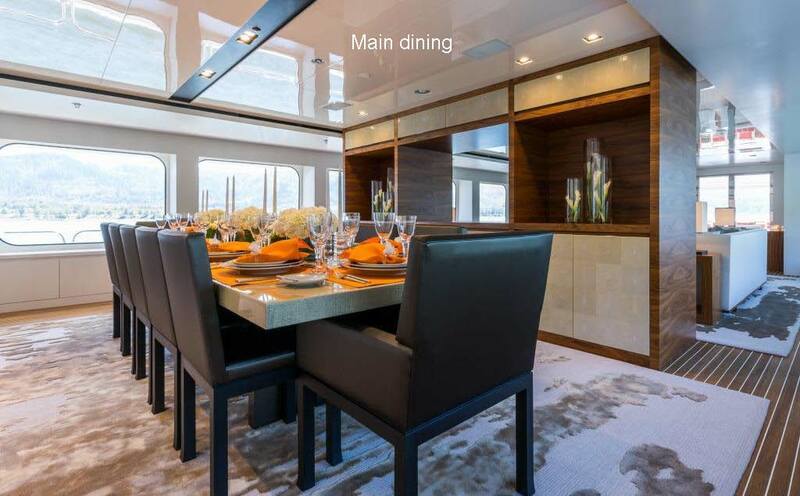 The formal dining room in black and white with gorgeous table setting features Mother of Pearl Walls, and cameras give the stewardess notice of service needed. 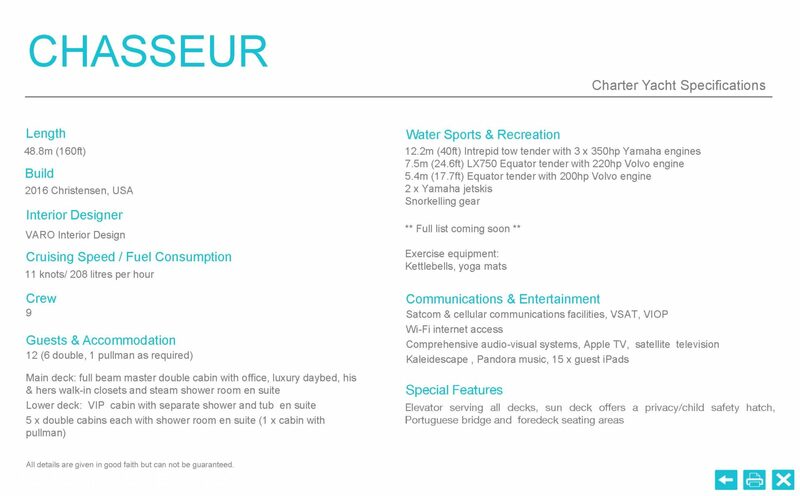 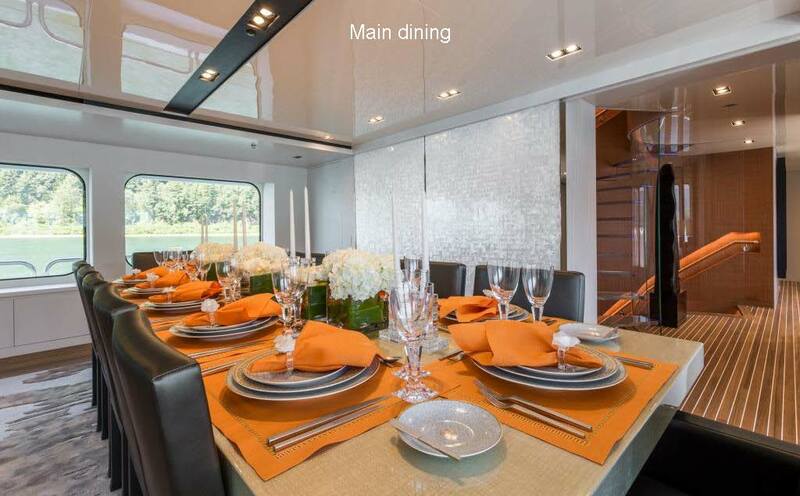 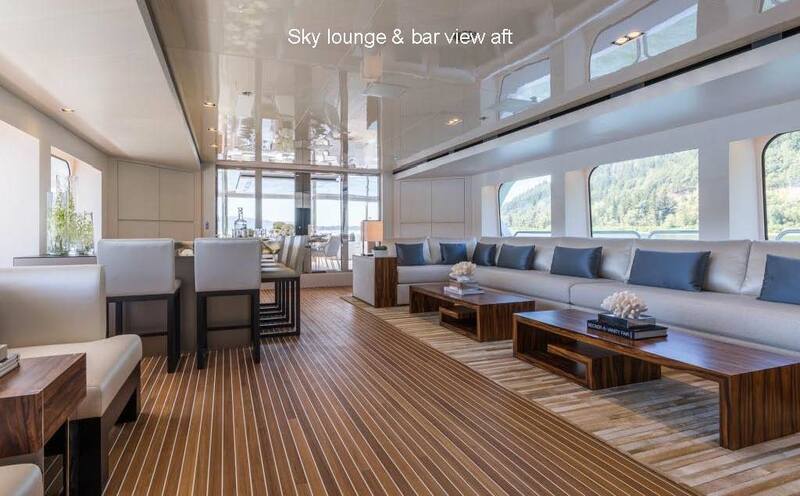 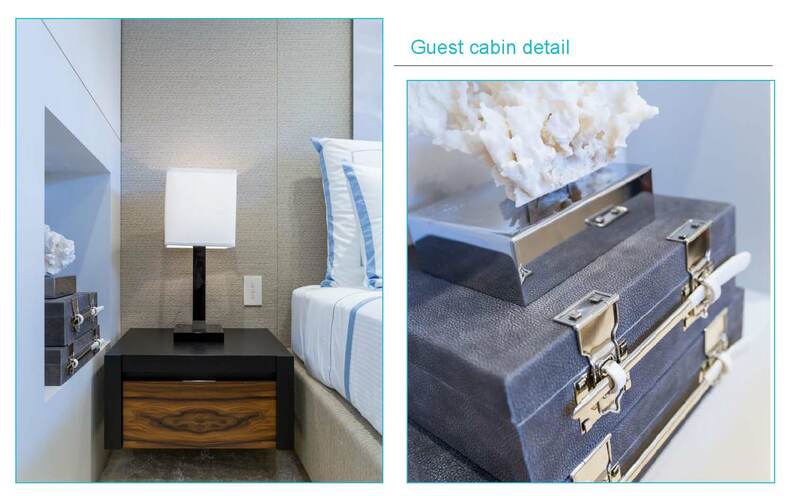 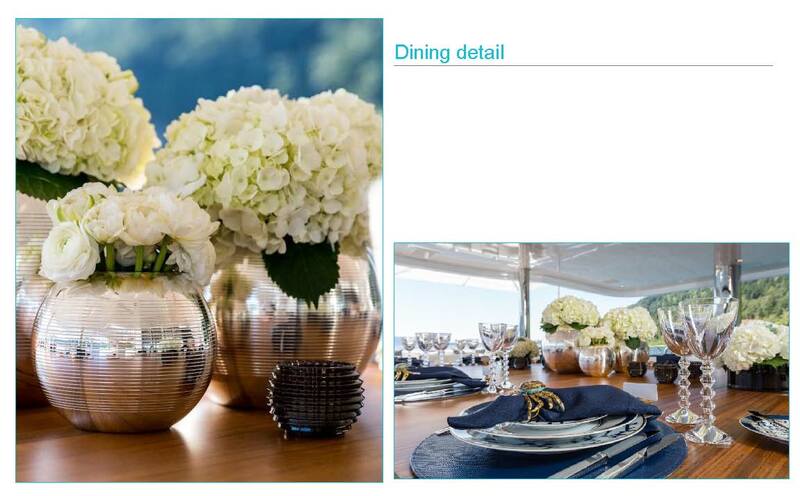 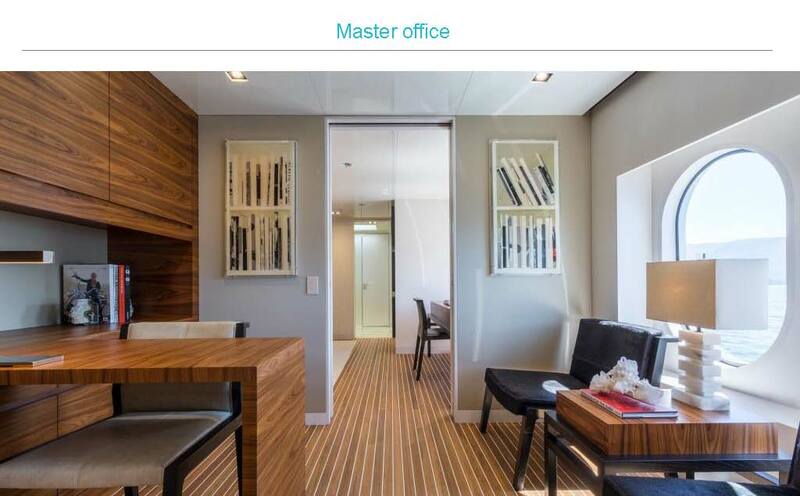 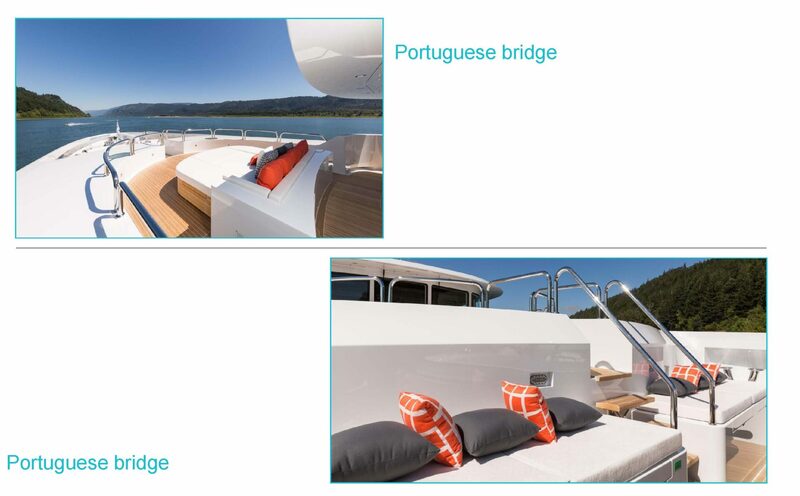 CHASSEUR has six guest cabins for parties of twelve. 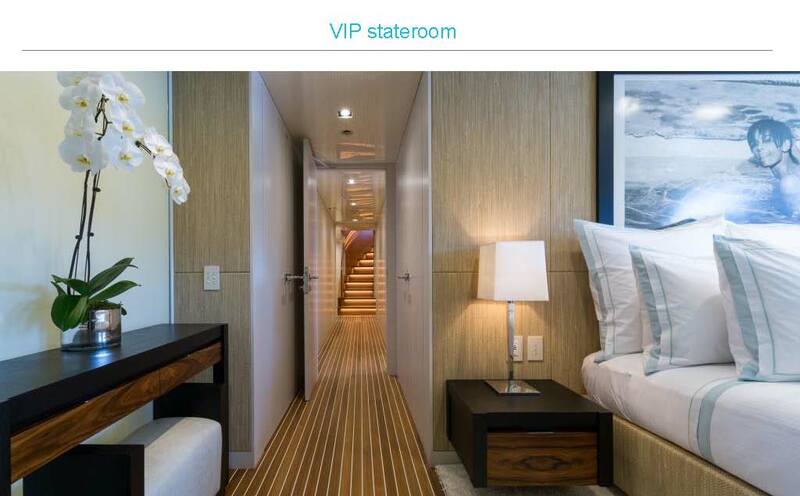 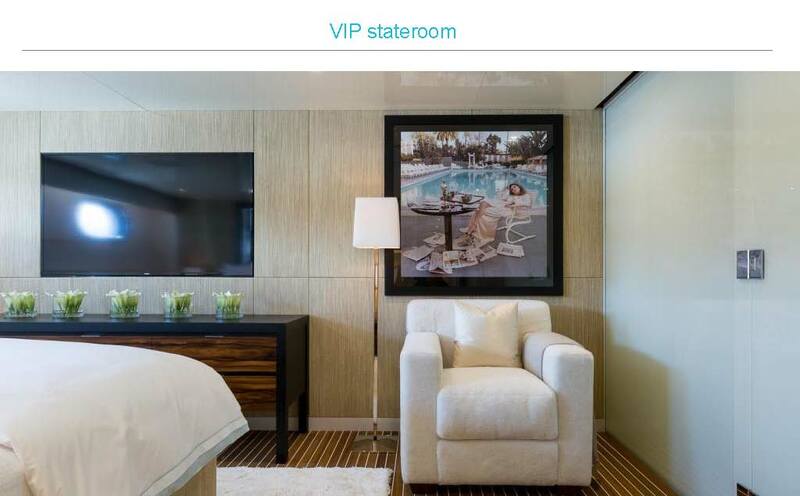 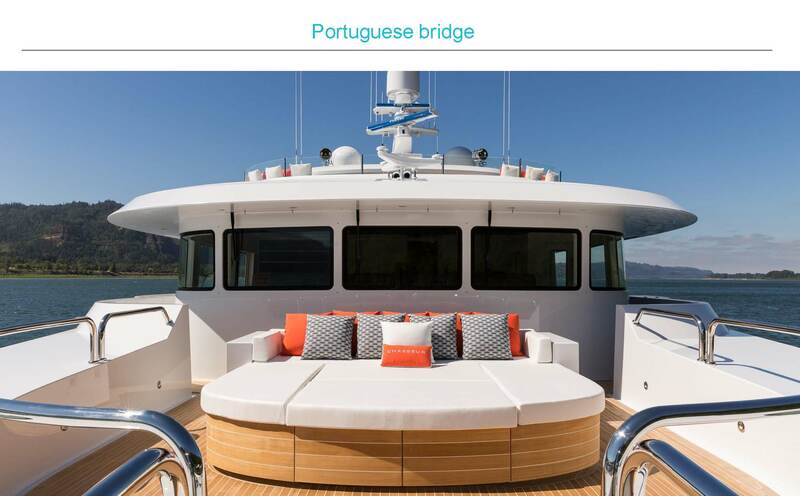 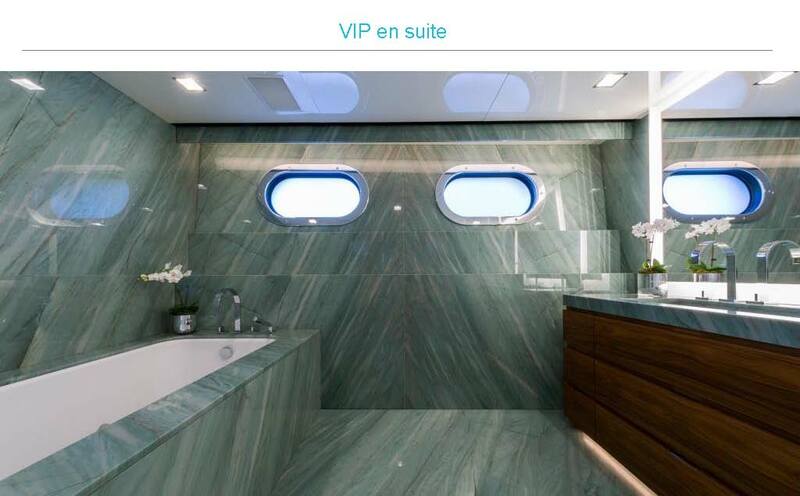 She offers a second, full beam VIP cabin below as well with exquisite onyx bathroom, again with rain, handheld, steam and Jacuzzi bath, double wide sinks, and heated flooring. 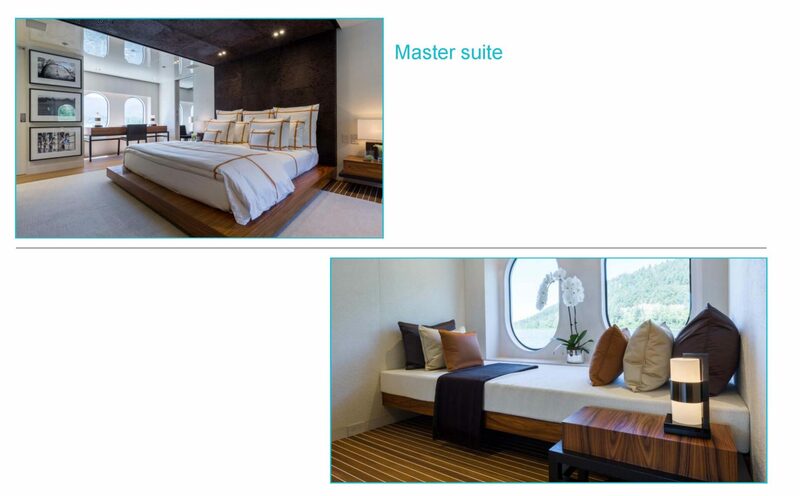 The two VIP guest cabins each have King beds and lots of space; they too have onyx bathrooms, and a Butler’s pantry, and two Queen cabins are forward, identical; one has a Pullman. 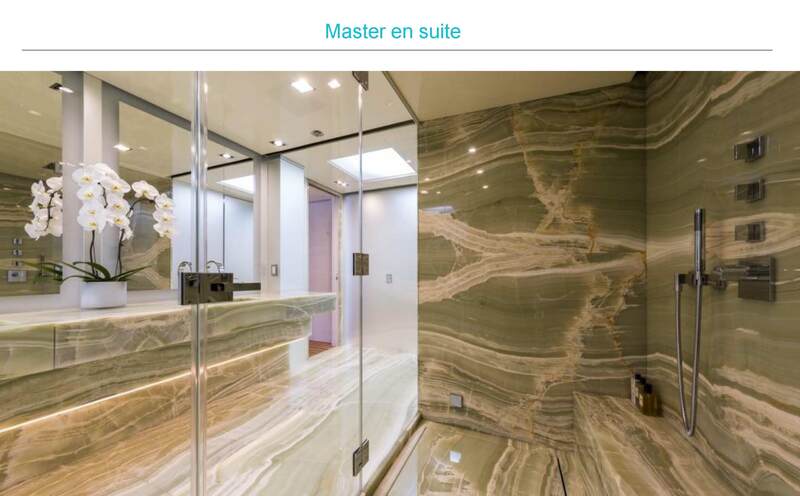 All have onyx bathrooms….this one in blue, that one in gold, the other in cream, etc – and all have thick pile carpets and robes. 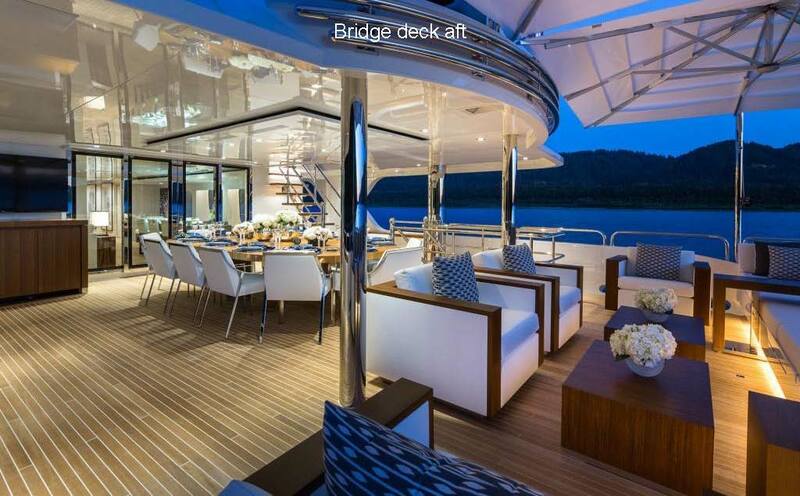 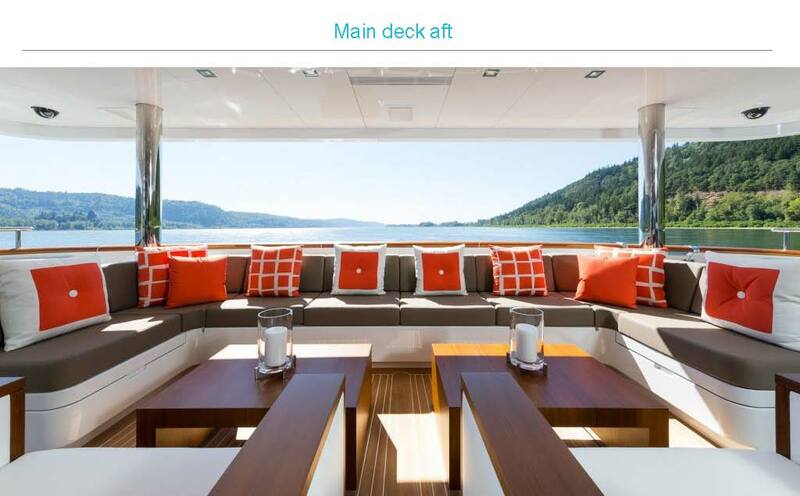 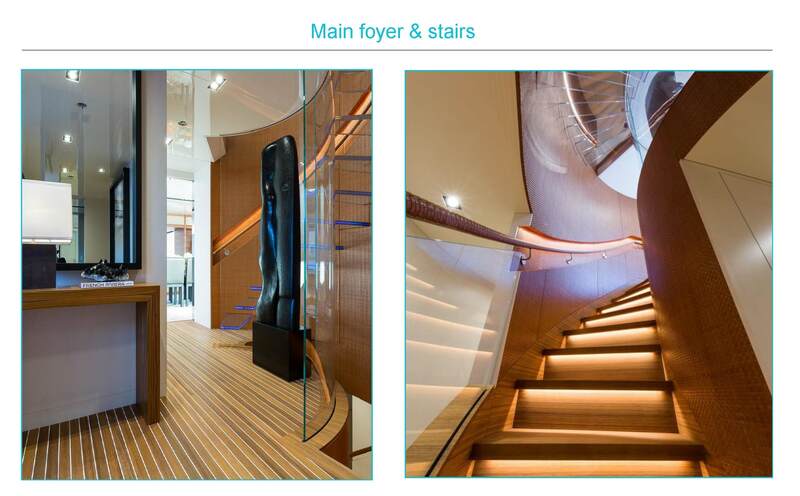 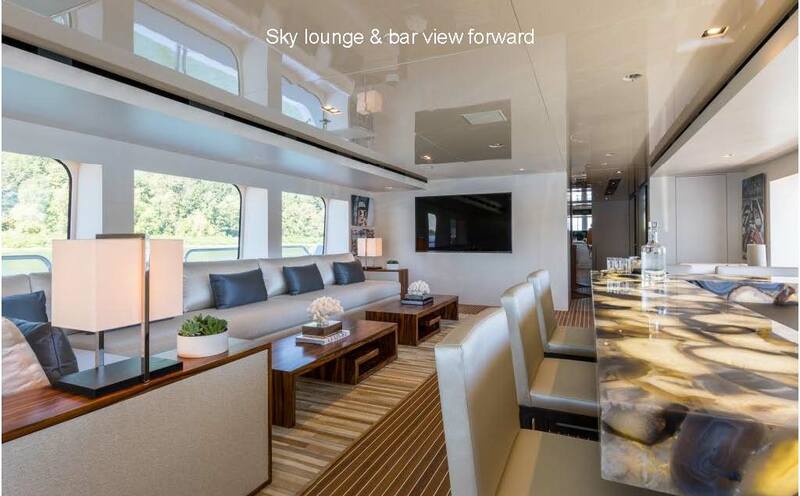 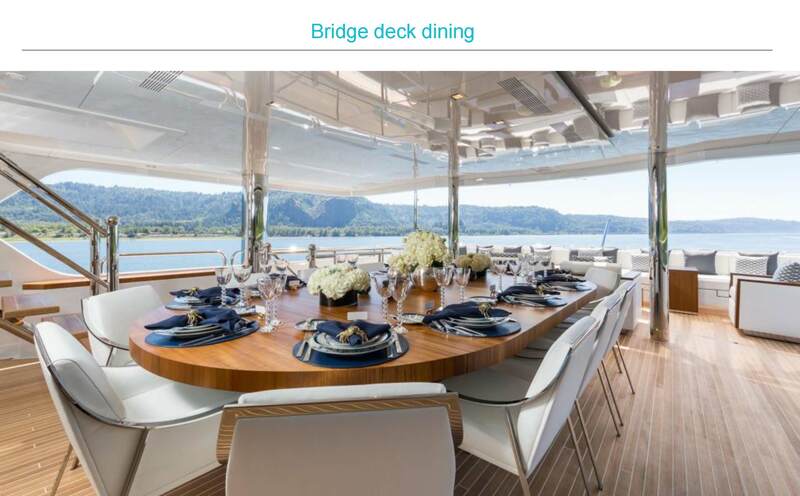 A cantilevered glass staircase, as well as an elevator, which serves all four decks, connects the guest cabins on the accommodation deck to the sky lounge on the captain’s bridge deck, which has state of the art navigation equipment and a desk with work space. 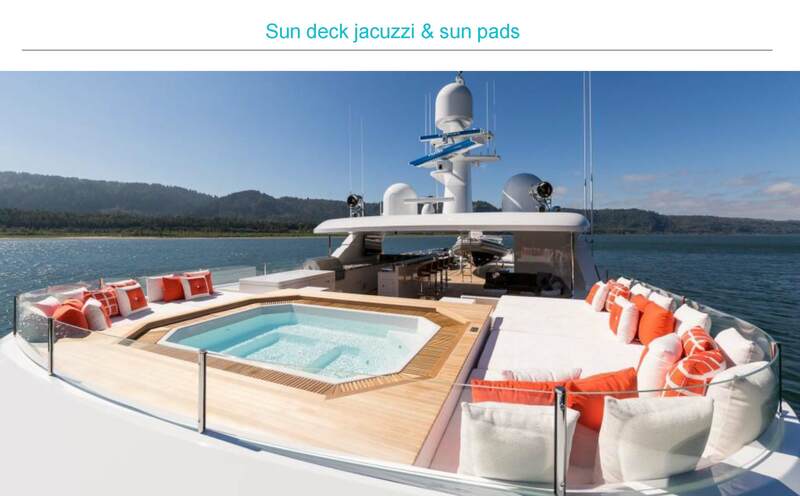 The day beds around the Jacuzzi on the Sun Deck with helipad, hard top, outdoor climate control, and bar with stools is again very special! 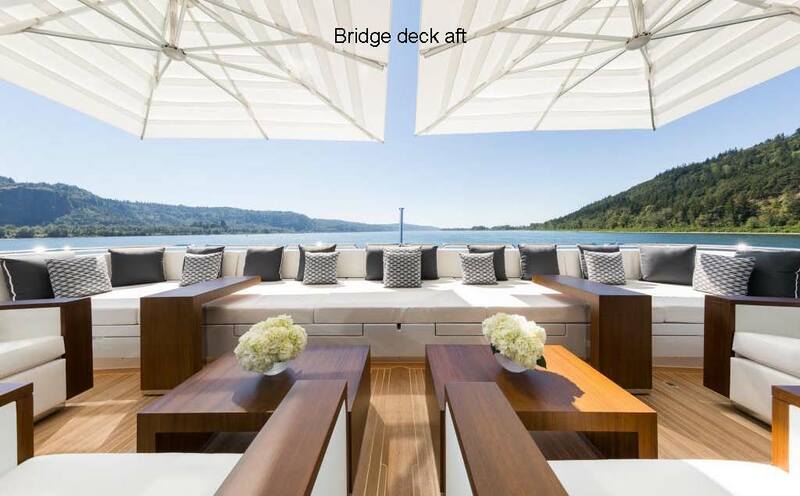 It has been raised to be flush with the horizon, so sunbathers can see out to the views, and safety railings have been put up, so that children can climb around. 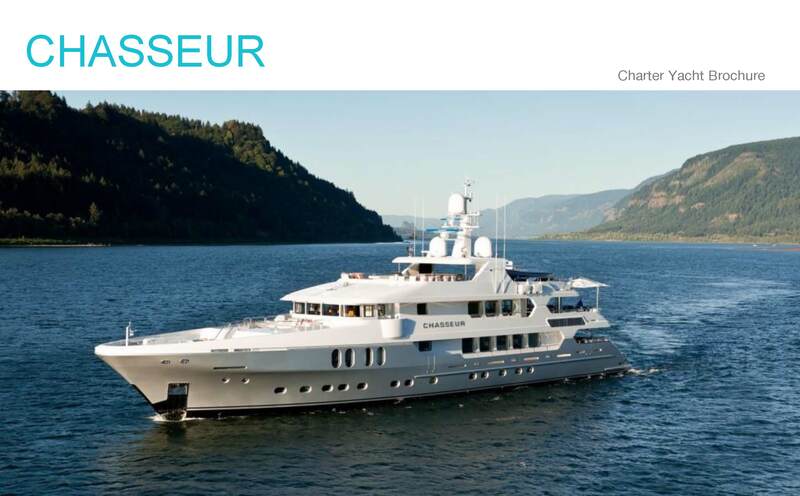 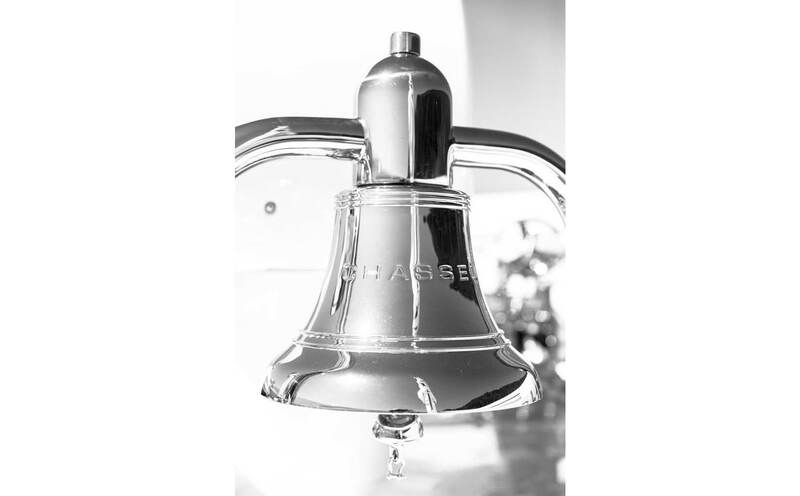 CHASSEUR is available in the Caribbean during the winter and West Med – France, Monaco and Italy – during the Summer of 2017.